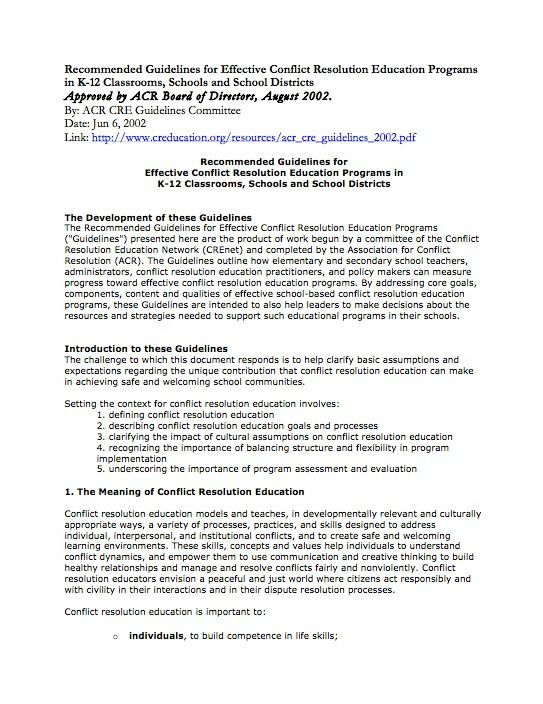 These Recommended Guidelines for Effective Conflict Resolution Education Programs, released in 2002, are the product of work begun by a committee of the Conflict Resolution Education Network (CREnet) and completed by the Association for Conflict Resolution (ACR). The Guidelines outline how elementary and secondary school teachers, administrators, conflict resolution education practitioners, and policy makers can measure progress toward effective conflict resolution education programs. By addressing core goals, components, content and qualities of effective school-based conflict resolution education programs, these Guidelines are intended to also help leaders to make decisions about the resources and strategies needed to support such educational programs in their schools.